My parents visisted us last week and we had a great time. 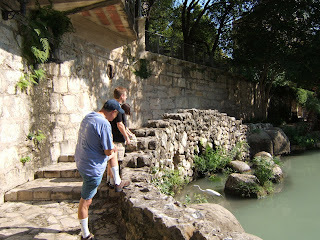 We visited the Riverwalk, San Antonio Museum of Art, and Gruene, Texas (pronounced "green"). Mom and Dad visited the King William District on their own. We ate at a couple of favorite places, including Shilo's Deli and Rudy's. Above I posted a few pictures from the visit. 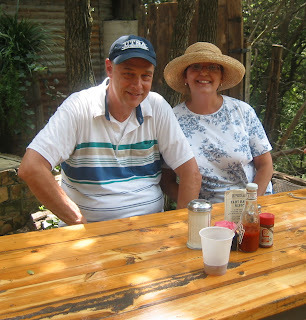 The first picture of is of Mom and Dad at the Gristmill Restuarant in Gruene. 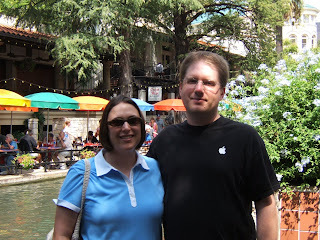 The second picture in of John and me at the Riverwalk with Casa Rio in the background. 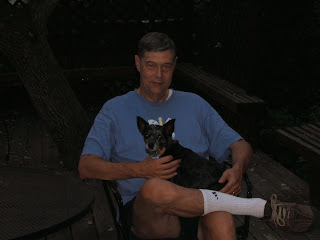 The third picture is of Dad and Frida. She was a little timid at first, but Frida made friends. The last picture is of us looking at a crane at the Riverwalk. Not only do the tourists go to the Riverwalk for lunch, so does the crane. We watched the crane find a minow in the river.